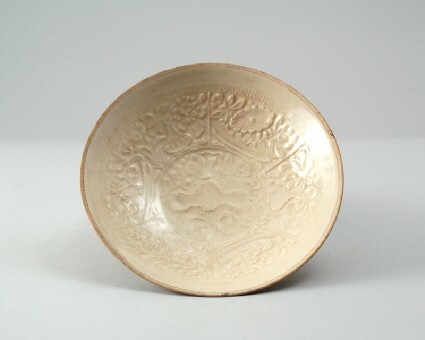 The shallow bowl has rounded sides and a very low footring. It is moulded with a central lotus bouquet, consisting of a bloom, large leaf and a pod, tied together with a fluttering ribbon. The sides are divided into six panels, filled with seasonal flowers arranged alternately in pear-shaped vases or tripod jardinieres, showing camellia, peony, lily, lotus, chrysanthemum and prunus. The faintly blue-tinged glaze was wiped from the rim where the off-white body is visible and where a metal rim mount has left dark traces.